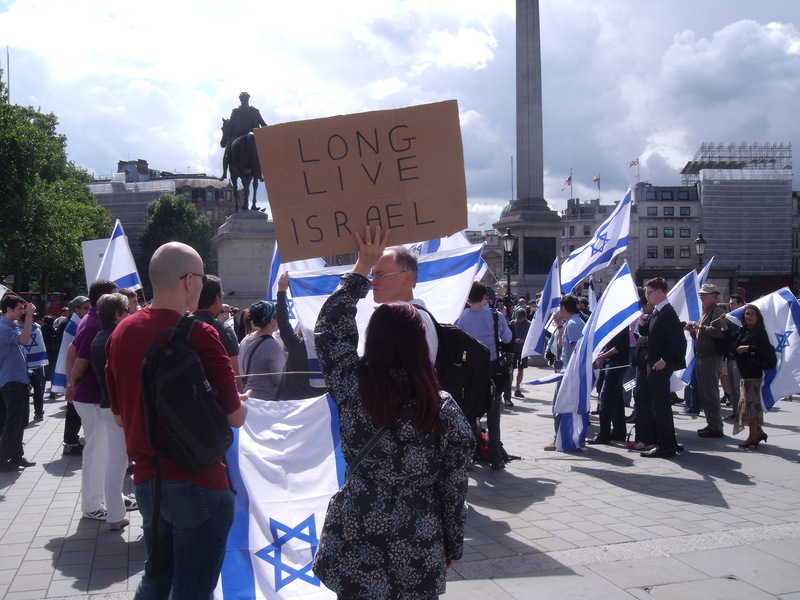 Israel’s supporters out in force in Trafalgar Square. Lord Nelson keeps a watchful eye over Israel’s supporters today. 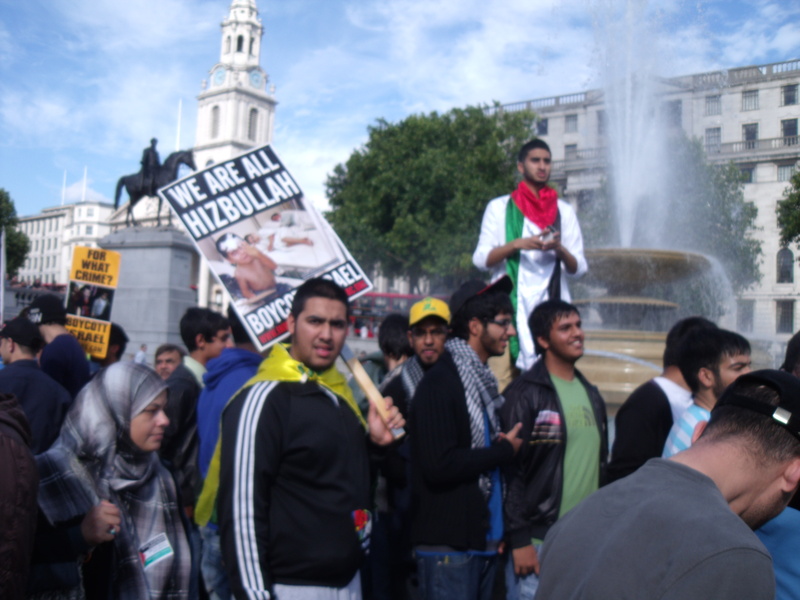 Israel’s supporters came out in Trafalgar Square today to show sympathy with Israel as rockets continue to rain down from Gaza and to wish a happy 25th birthday to Gilad Schalit who is in his sixth year in isolation in Gaza having been kidnapped by Hamas from Israeli soil when he was 19. There were some tremendous speeches. 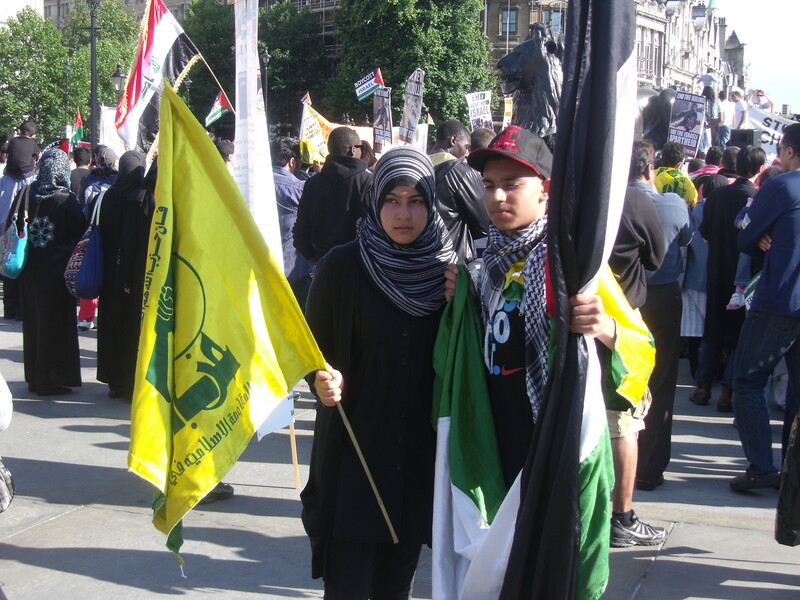 Hasan Afzal, of British Muslims for Israel, said he supports Israel because it is “the only country in the Middle East where Muslims have freedom and democracy”. 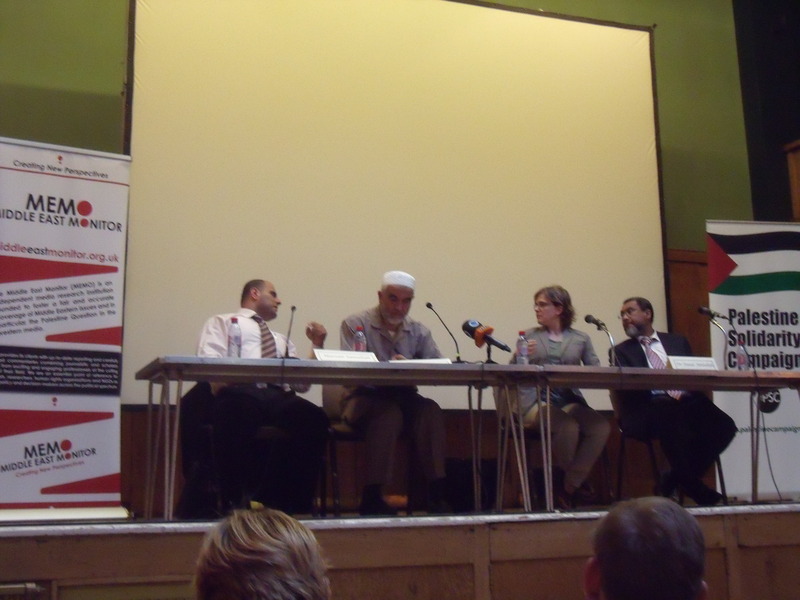 Joy Wolfe urged the crowd to ignore media lies about Israel and described Israel as a home for people of all religions. She went on to call for an end to the double standards of the United Nations and some British MPs and said that Gilad Schalit probably doesn’t even know that today is his birthday and probably feels as if he has been forgotten. But she said that no one will rest until the Red Cross gets access to him and every government in the world is calling for his release. It was an excellent afternoon arranged at very short notice by the British Israel Coalition and supported by Stand With Us. 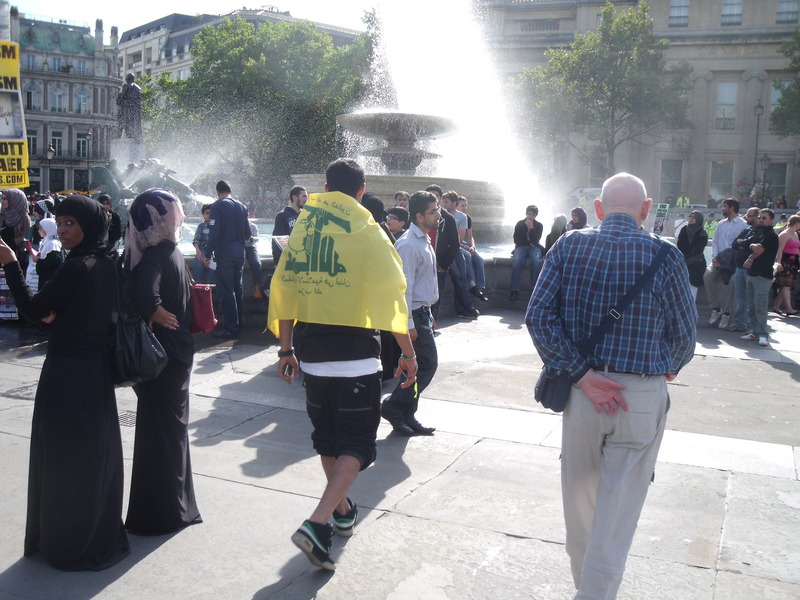 It made a change from the previous Sunday’s terror rally at Trafalgar Square where the rhetoric called for war with Israel and signs called for Death to Israel. 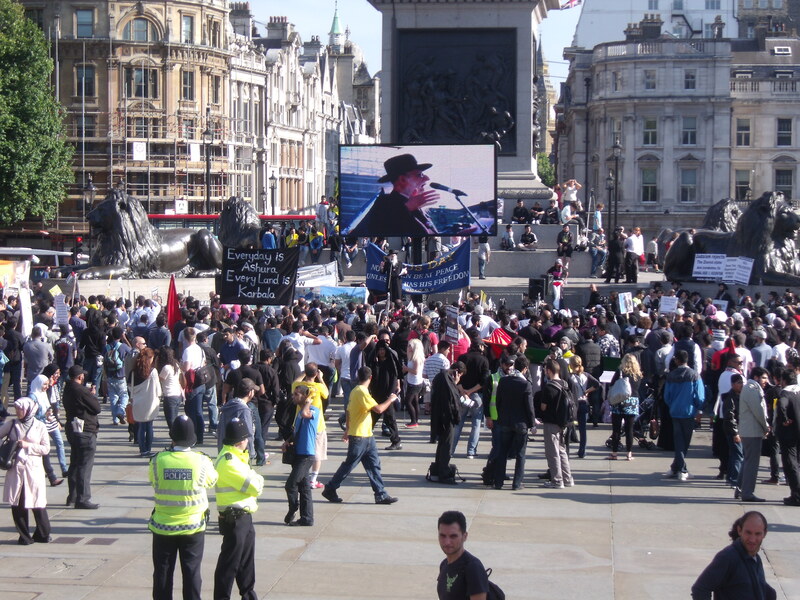 It’s a shame there wasn’t a similar pro-Israel rally at that time. 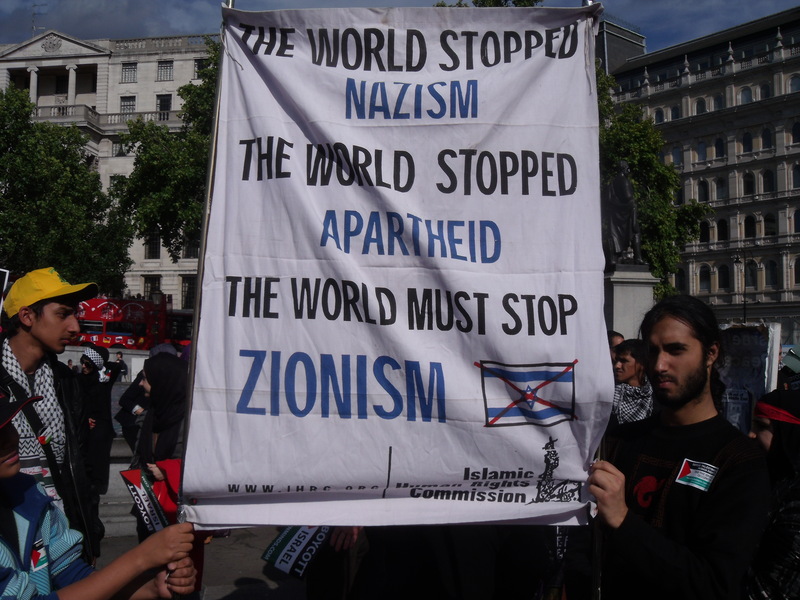 But with that in mind the Zionist Federation is arranging a counter-demonstration this coming Thursday from 6pm till 8pm outside the Royal Albert Hall where the Israel Philharmonic Orchestra is playing at the BBC proms. 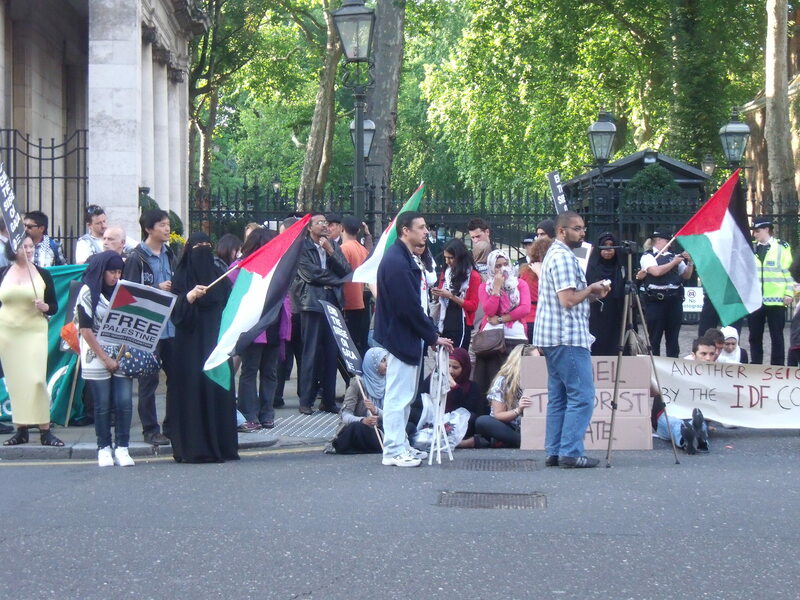 It is in response to a Palestine Solidarity Campaign anti-Israel protest. Some sort of disruption is also expected to take place inside the Hall while the orchestra is playing. Nearest tube stations are South Kensington (District, Circle, Piccadily lines) and High Street Kensington (District and Circle lines). 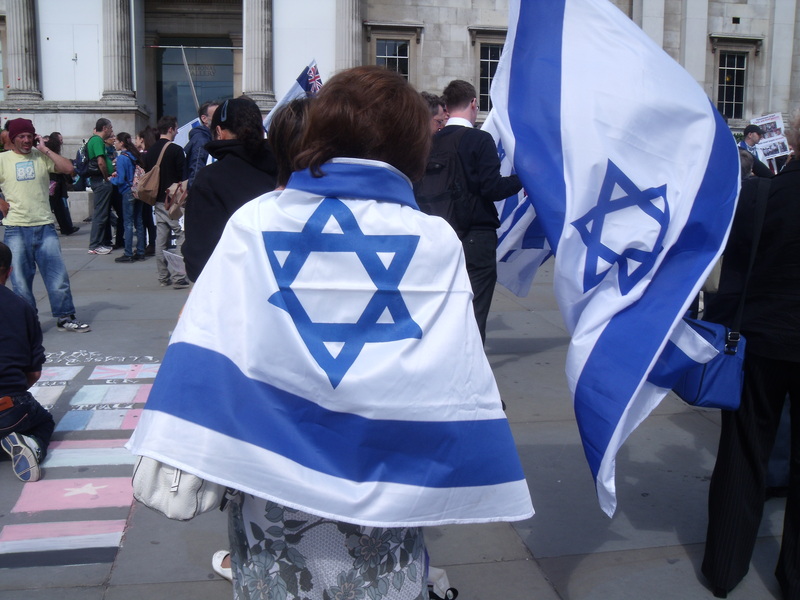 It will be an opportunity to defiantly wave Israeli flags in the faces of all those whose sole desire in life is to see the Jewish state destroyed. A sign for Lauren Booth to drool over. 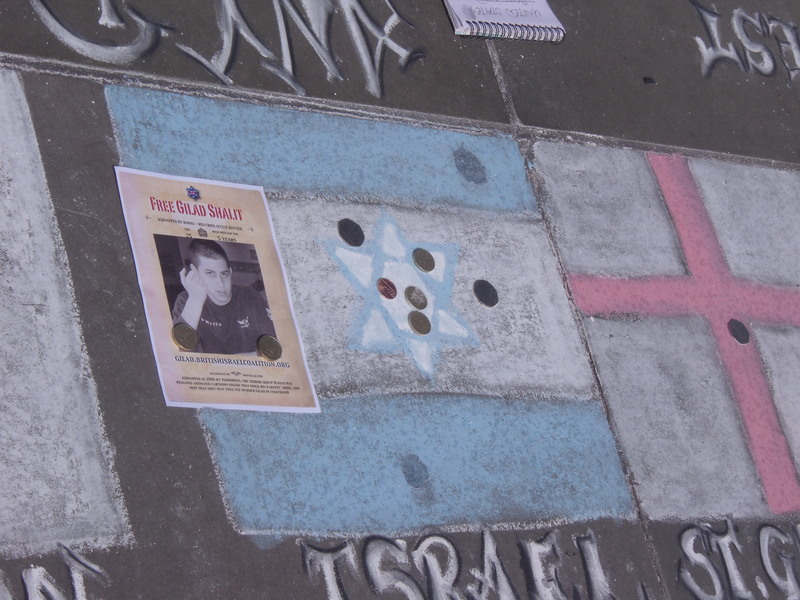 Remembering the Fogel’s whose throats were slashed by a Palestinian terrorist while in their beds. 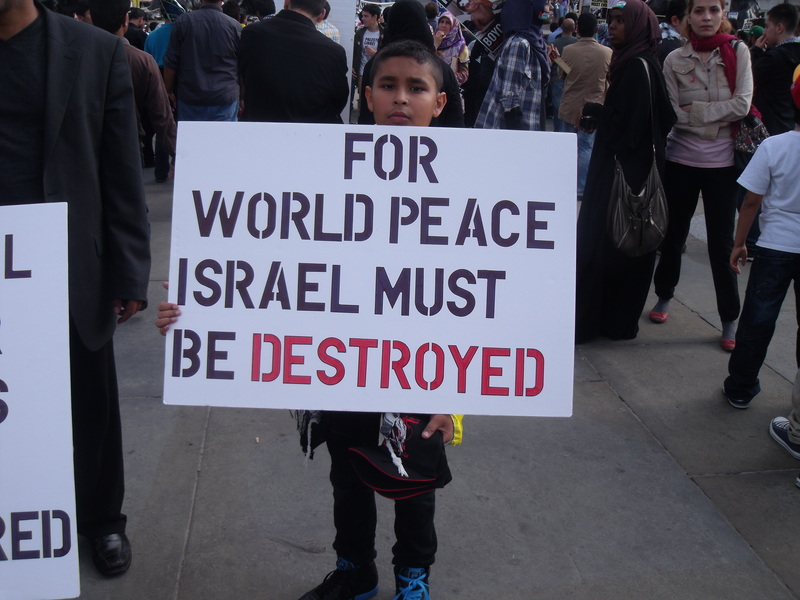 Four simple words that could do so much for peace in the Middle East. 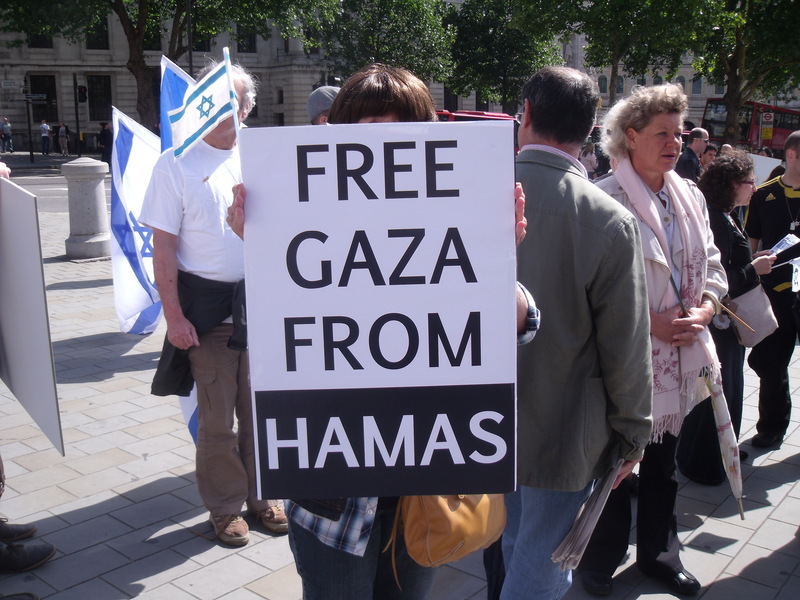 And free the Palestinians from Hamas also. 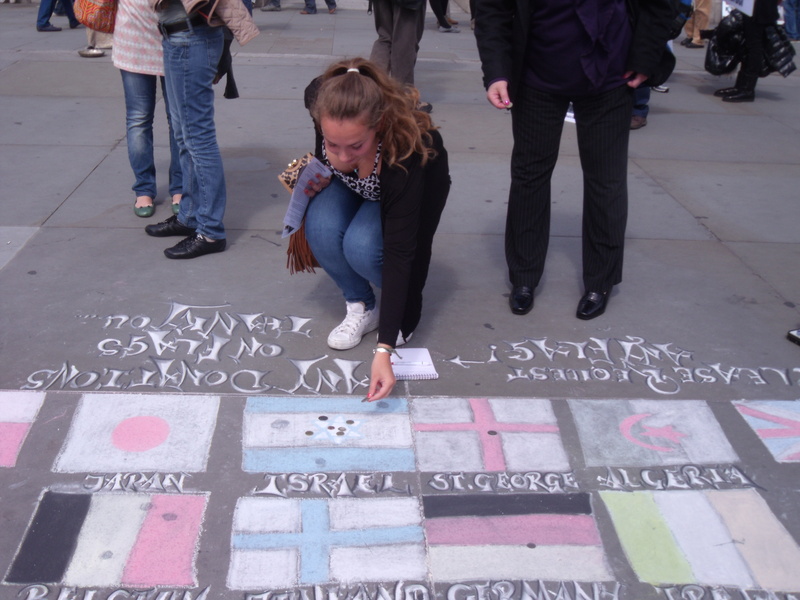 Appreciating a pavement artist’s work. The chap in gold was seen having a cheeky cigarette five minutes later. A good way to keep warm. 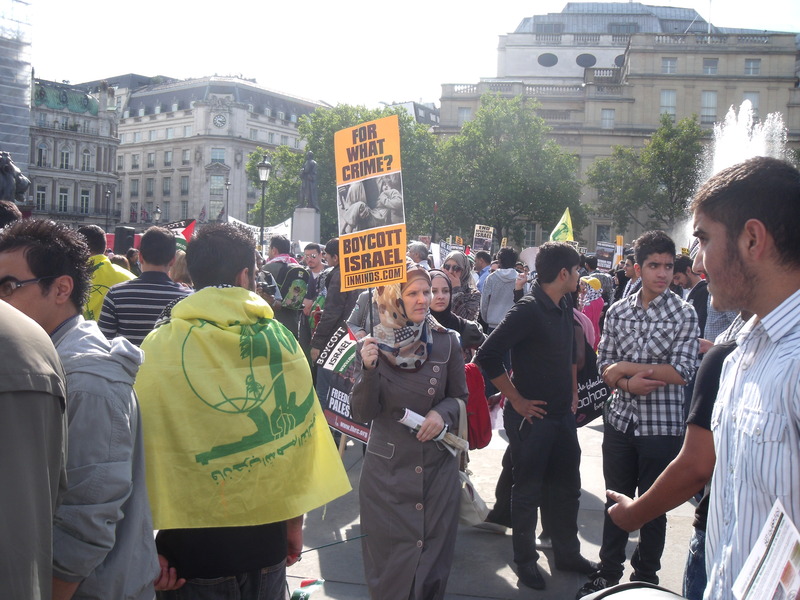 Lauren Booth: “Lebanon, Jordan and Egypt must liberate Jerusalem”. 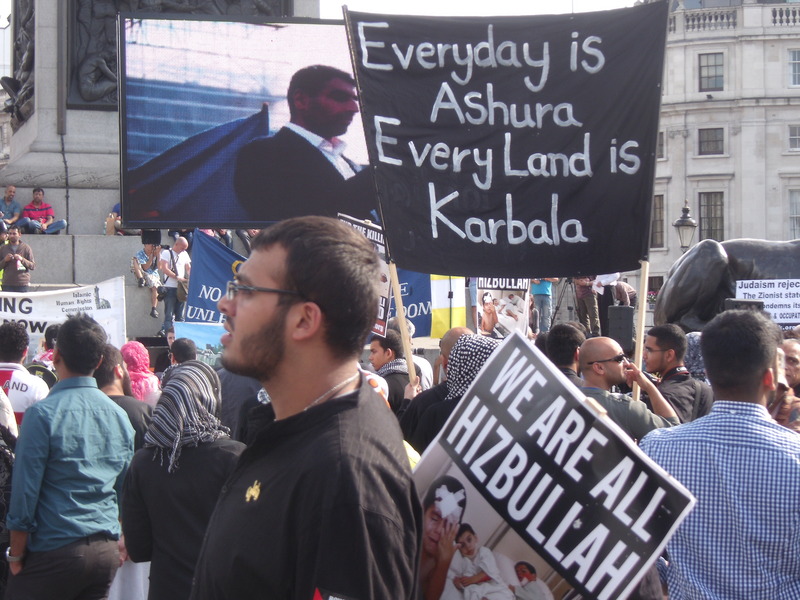 Al Quds Day was creatively subtitled “End the Siege, End the Occupation, End the Israeli Apartheid”, but for brevity they might just have subtitled it “End Israel”. 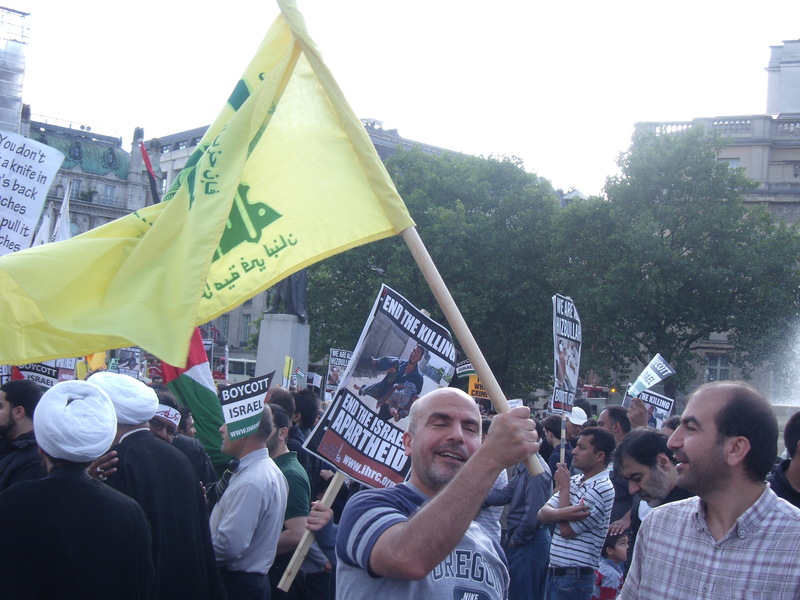 Yellow Hezbollah flags were everywhere with the flag’s usual gun emblem, which is especially menacing considering that the head of Hizbollah has said that Jews are descended from pigs and apes and that if all the Jews in the world gathered in Israel it would save Hizbollah the trouble of going after them elsewhere. 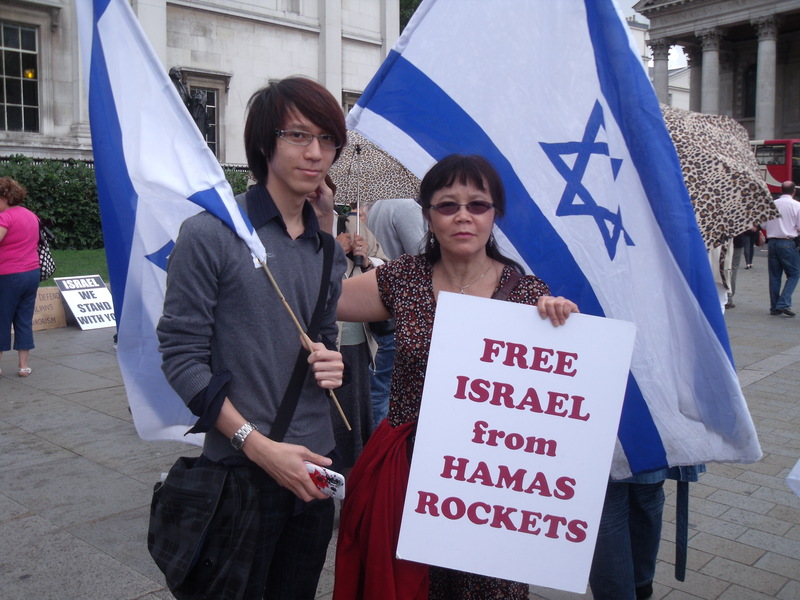 I felt that the rhetoric and placards were nothing short of incitement to racial hatred and violence, not just against Israel and its citizens, but against the many Israeli tourists and residents in the UK as well as British Jews, and non-Jews, who wish to express support for Israel. Had similar threats been made against Britain the police would have acted. They can still act as they were recording footage. But there is no point filming and doing nothing. 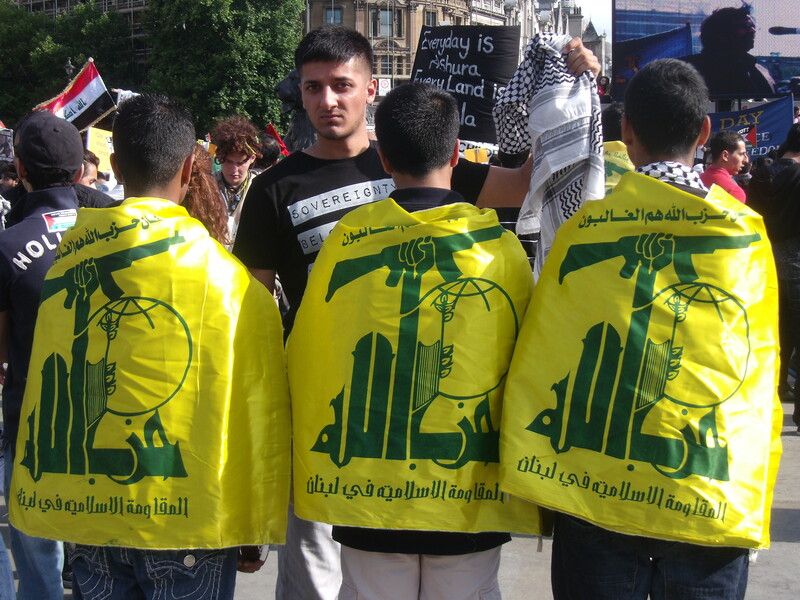 When will we start to see arrests for incitement? 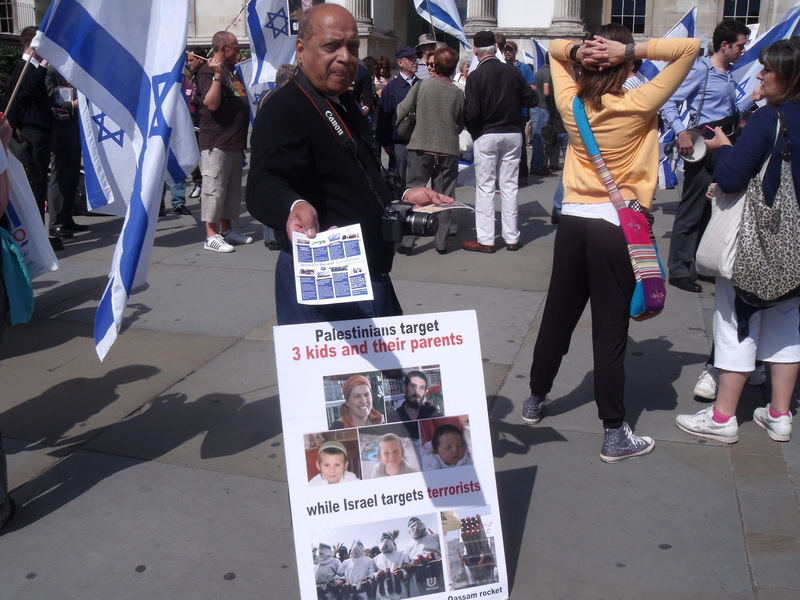 As Israelis bury their dead, scenes from London…..
As Israeli families were still burying their dead after yesterday’s murders anti-Israel activists arrived at the Israeli Embassy in London to show support for the Palestinian terrorists that carried out the atrocity. They repeatedly called for Israel’s destruction and after they started to surround me I was told by the police, under threat of arrest, to stop filming (clip 1 below). From the clips you get a sense of the vileness of the crowd that had gathered. I also seem to have acquired a rather unattractive stalker (clip 4). 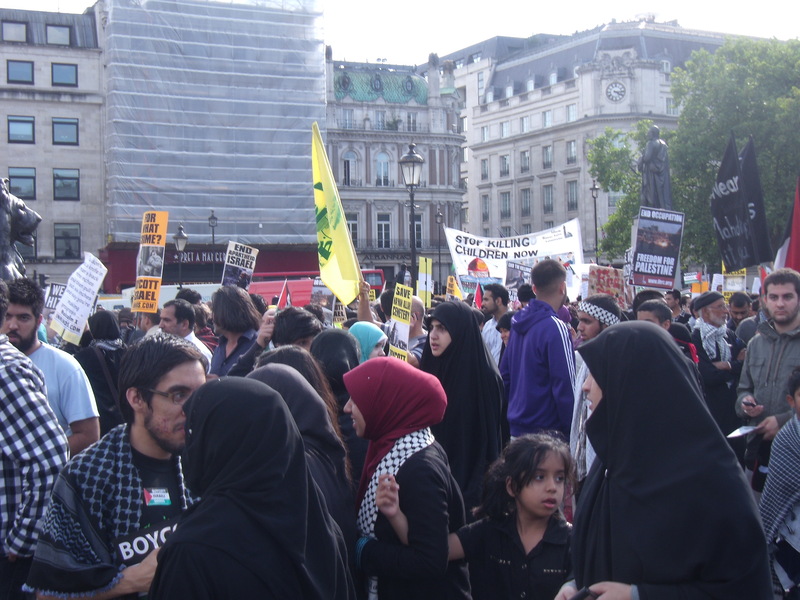 But the most sickening sight was that of the Neturei Karta, who passed me as I was walking back to get the train, en route to the Israeli Embassy to join in. Even the day after eight of their fellow Jews were murdered the “Rabbis” couldn’t lay low. And this just an hour before the beginning of Shabbat. 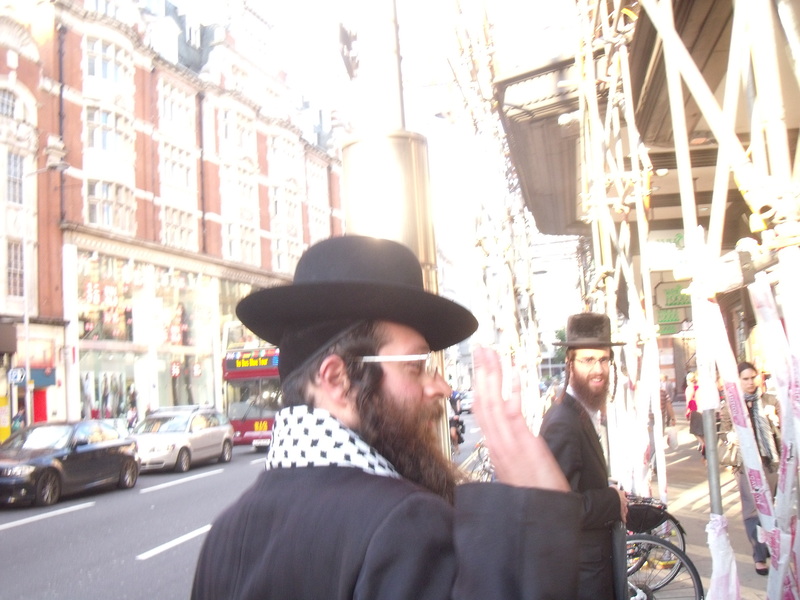 Neturei Karta on way to Israeli Embassy. 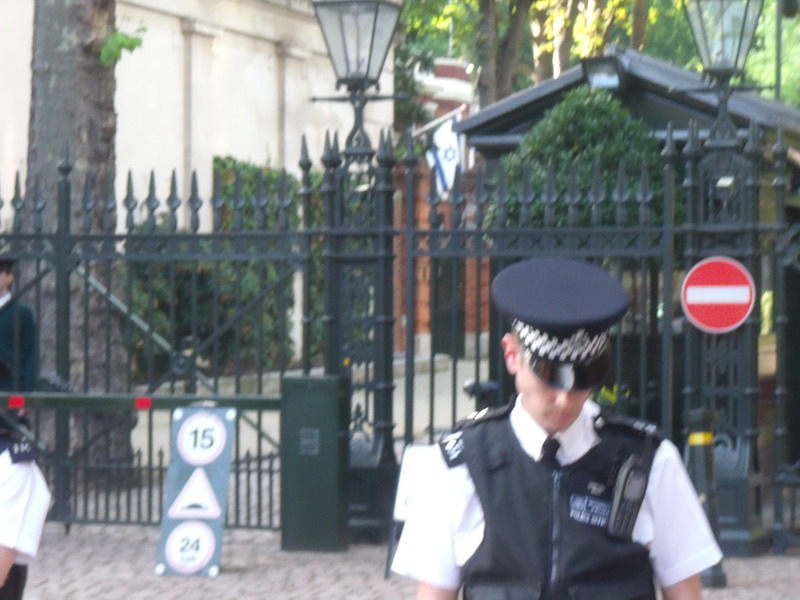 Israeli Embassy, London, under guard. clip 1: Stopped from filming under threat of arrest. 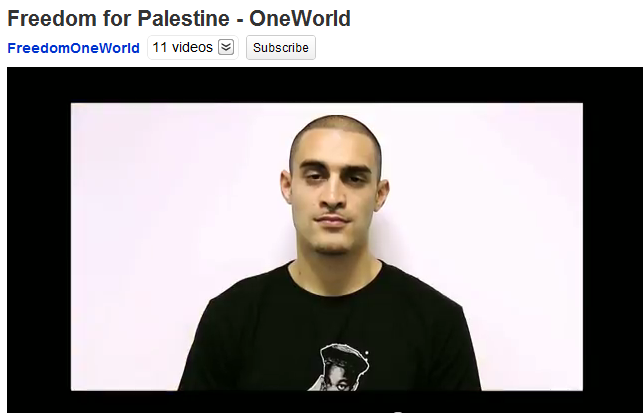 clip 2: Intimidation by an anti-Israel activist. 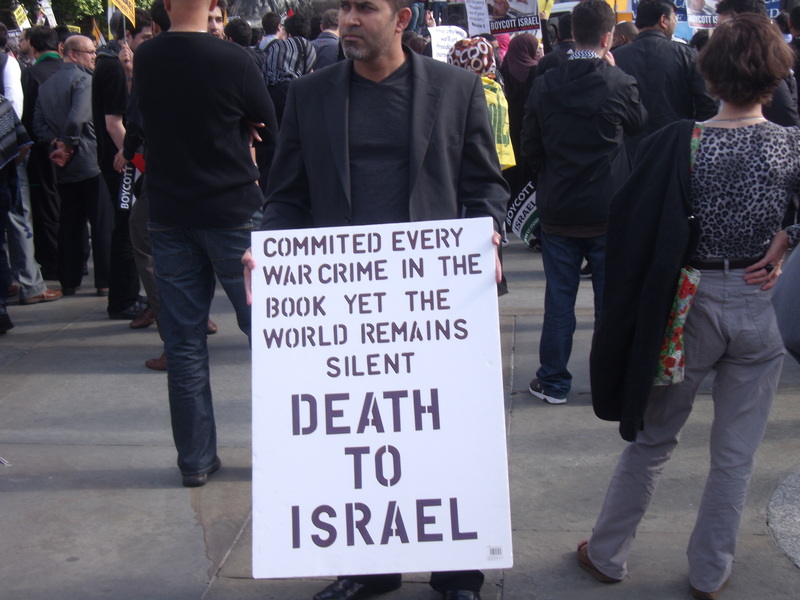 clip 3: Calling for Israel’s destruction. 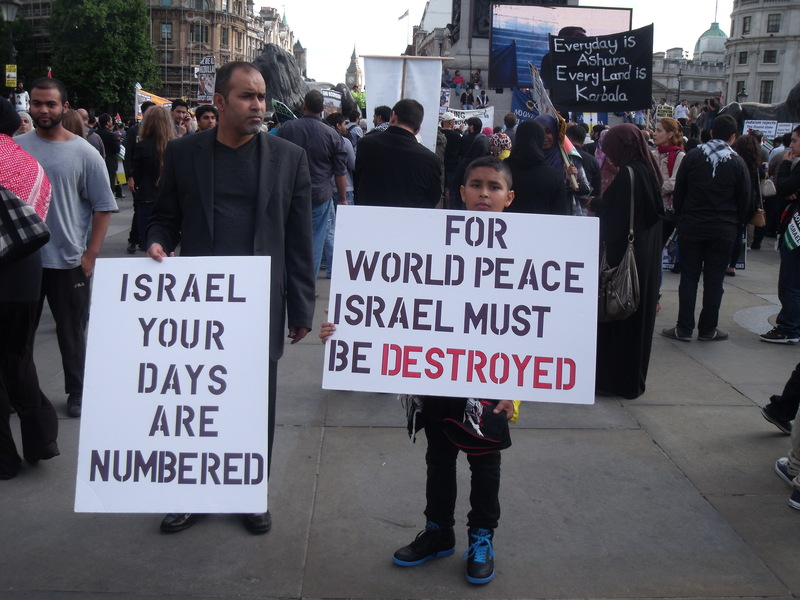 clip 5: Calling for Israel’s destruction again. clip 6: And calling for Israel’s destruction again. Yachad’s continued support for calls to boycott Israeli settlements is dangerous. But there is a very fine line between supporting the right to call for boycotts of settlements and actually supporting boycotts. 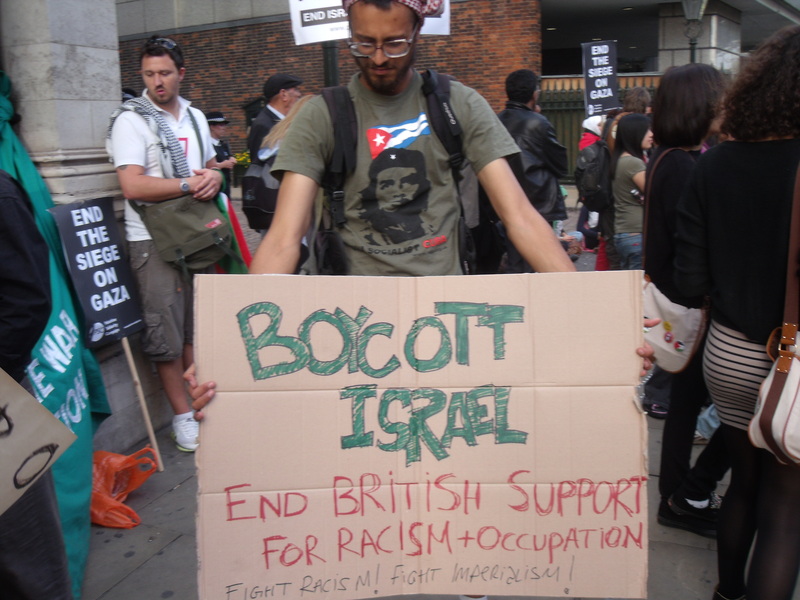 In fact calling for boycotts is far worse than the boycotting itself. 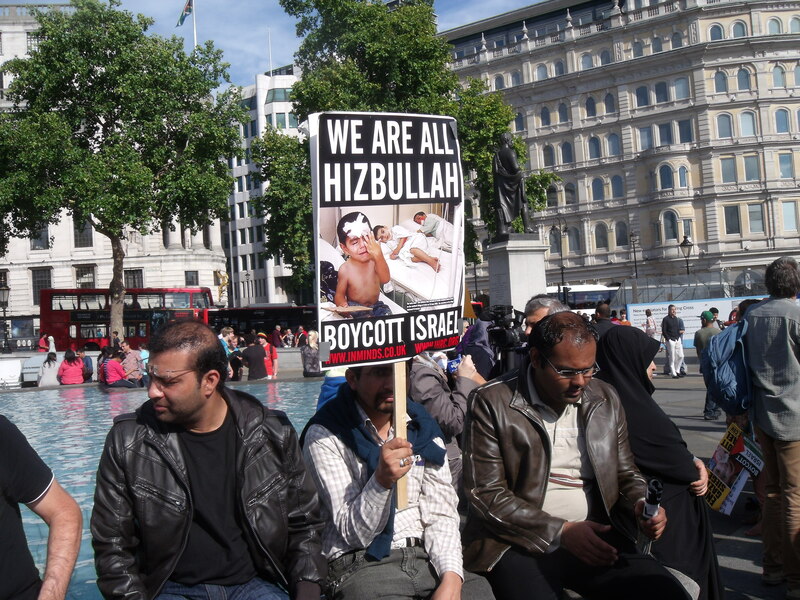 I have no problem with someone taking a private decision to boycott the settlements. But what goes along with the calling for boycotts is a demonisation of settlers, which contributes to continued Palestinian violence against them. But we don’t have unlimited freedom of speech in the UK where, for example, you wouldn’t get away with gratuitously screaming “Fire!” in a crowded cinema. It would put lives at risk as people ran for the exits. Meanwhile, Weisfeld is putting lives at risk by wanting to allow the settlements and settlers to be demonised via calls to boycott them. And anti-settlement rhetoric quickly spills over into anti-Israel and anti-Semitic rhetoric, as we regularly see in the UK. But if Weisfeld is so keen on fixing Israel it’s Israel where she needs to live, not the UK, so she can persuade more Israelis to vote for anti-settlement parties. She could even set up her own political party. 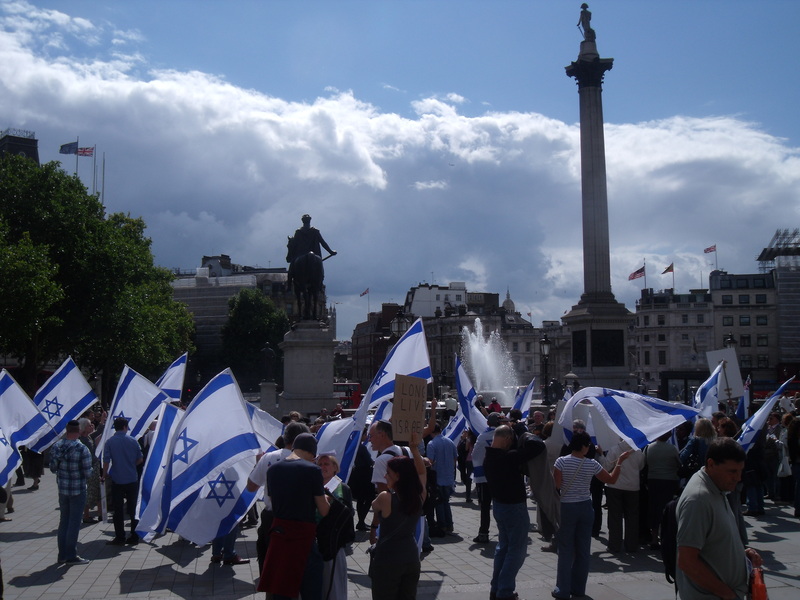 Israelis are not going to be persuaded by Weisfeld while she is sat in her relatively safe and secure UK surroundings, however many British Jews she thinks might back her. 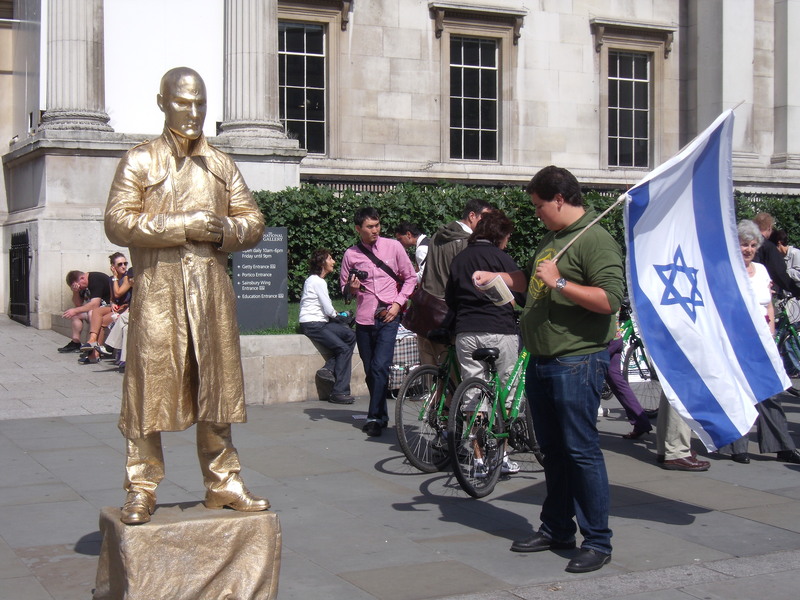 Most Israelis are not interested in what relatively safe British Jews think. In her article she names David Grossman, Meir Dagan, Amnon Lipkin-Shahak and “countless other military firgures” who back Yachad, but imagine the list of names who think that what Yachad is doing is dangerous. 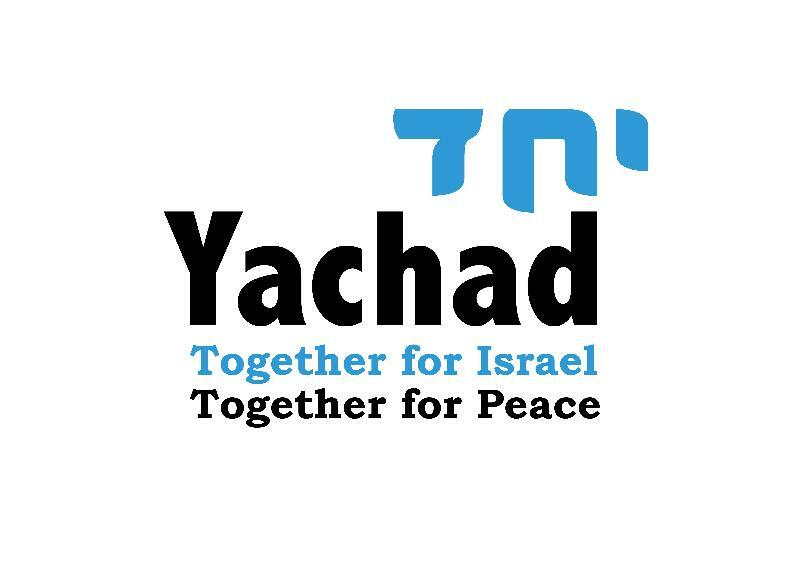 If Weisfeld, and those who support Yachad, really want to make a difference to Israel then they should consider making Aliyah and put their money where their mouths are for once. British Minister wishes to treat settlers like Dead Men Walking. Alan Duncan MP, 2nd from right, in the British Embassy in the UAE recently. 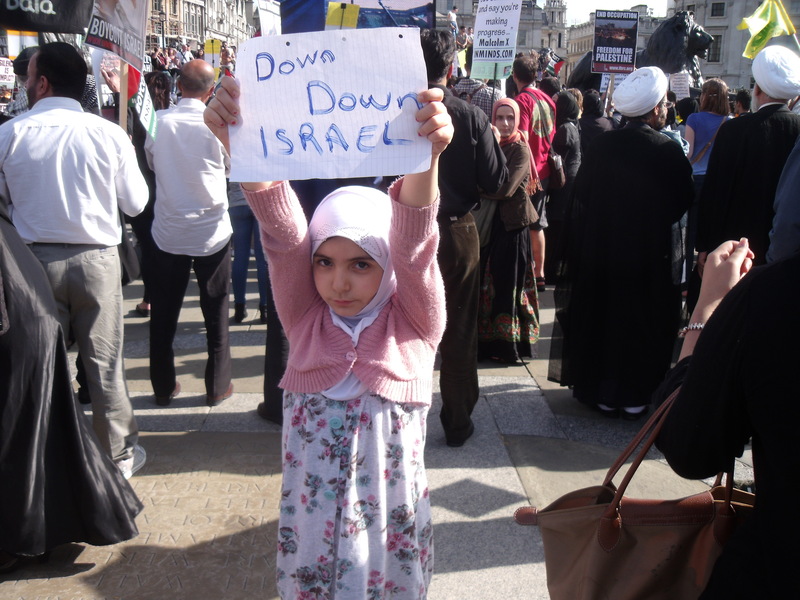 Is this Conservative government turning into one of the most anti-Israel in recent memory? Alan Duncan MP, the Minister in charge of Britain’s international aid budget, recently visited the “Occupied Palestinian Territories”, as the Department for International Development, calls them. He delivers these lines with all the spite of a seasoned British anti-Israel activist, not a considered government minister. Irrespective of the rights and wrongs of the settlements, if the wall was situated on the “proper Israeli boundary”, as Duncan calls it, the settlers would be immediately exposed to the risk of having their sloats slit by the likes of Hakim Awad who murdered Udi and Ruthie Fogel and their three young children in their beds. Does Mr Duncan really believe that all Israeli settlers should be dead men walking, for that is how he treats them? Meanwhile, the distance of the wall from the “Israeli boundary” reduces the opportunities for suicide bombers to blow up Israeli restaurants, buses and discos and for Palestinian terrorists to snipe at Israeli civilians. This also reduces the need for retaliatory attacks on Palestinian terrorist targets and, therefore, war. As JFK said, “A wall is a hell of a lot better than a war”. And as I understand it Israel’s eastern border is not a “proper Israeli boundary”, but merely an armistice line from 1949. Nothing has been agreed so, as it stands, Israel is not in breach of any law by positioning the fence where it has, subject to the decisions of Israel’s Supreme Court on its route. As the short video progresses we see Duncan complain about the long queues of Palestinians waiting to go through security checks before going into Israel to work. Does he really expect Israel to let them through without stringent security checks? He continues to express his hatred for the settlers when he accuses them of stealing water from the Palestinians. 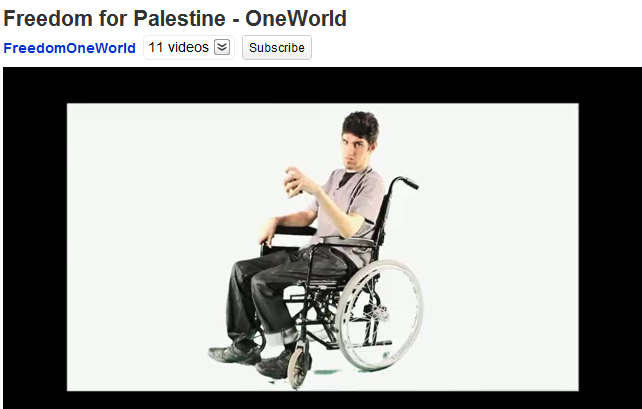 Finally, we come to the scene with which no anti-Israel video would be complete; that of a Palestinian baby. Here Duncan talks of a “financial crisis”, but Page 23 of the Global Humanitarian Assistance Report 2011 shows that the Palestinians received the second most amount of aid for any country between 2000 to 2009 at US$7.2bn, which is second only to Sudan at US$8.9bn. While, ElderofZiyon shows that, on a per capita basis, this figure far outstips any other country, including Sudan, by a mile. Duncan should ask why there is still a “financial crisis” when the Palestinians receive such huge amounts of financial assistance. Where has all the money gone? Duncan’s pre-Parliamentary career was as an oil trader where he made millions. Considering he doesn’t know the difference between an armistice line and a border and doesn’t seem to have too much of a problem with settlers having their throats slit, “respected” is not a word I word use to decribe our Minister of State for International Development. And being the Arabist he is, one should question whether he should be in charge of an international department in the first place. Jody McIntyre gone from the Indy, the HuffPo. and Channel 4. Jody McIntyre; gone from the Indy, HuffPo. and Channel 4 for possible incitement to riot. McIntyre was also due to have his own tv show starting on Channel 4 on August 18th called Bars For Change. Here is a peek from youtube. It has also just been pulled. 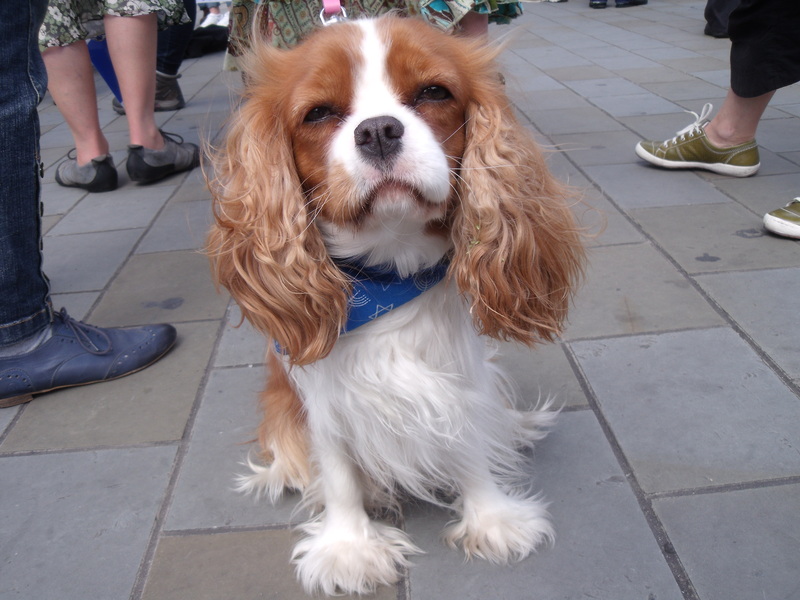 As Lucy Lips says he will still have a home with the Palestine Solidarity Campaign, which, as we have seen, actually applauds rhetoric calling for London to be burned. 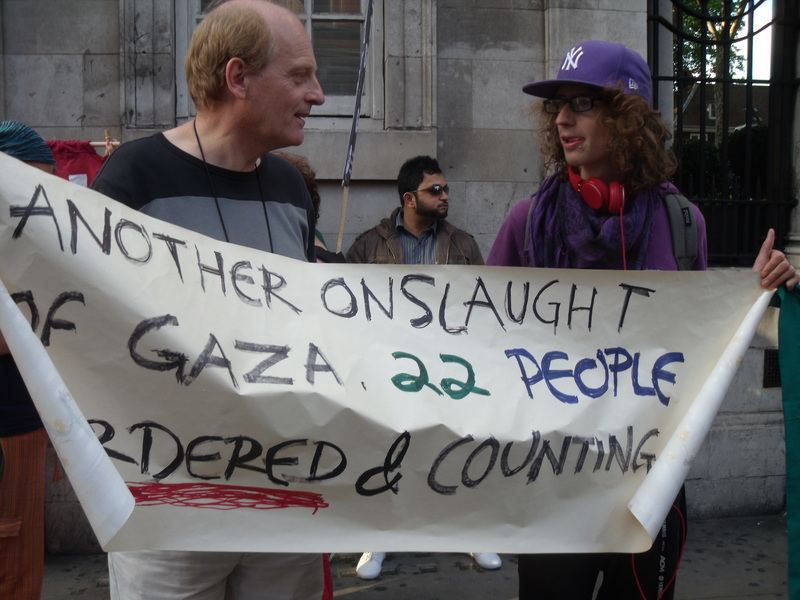 Meanwhile, the Palestine Solidarity Campaign’s anti-Israel demonstration will be taking place as usual outside Ahava this Saturday dragging even more essential police resources away from emergency situations across London. Around 20 police officers have to present to stop anarchists from invading Ahava and intimidating its customers. 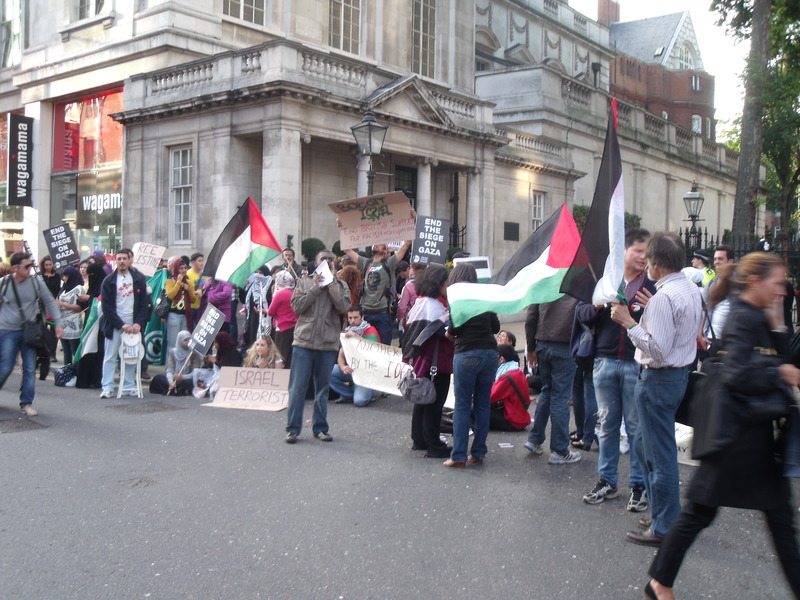 But if you have any spare Plasma TVs or Nike trainers please bring them down to Ahava and give them to the protesters. It could save an awful lot of London’s shop windows being smashed in. 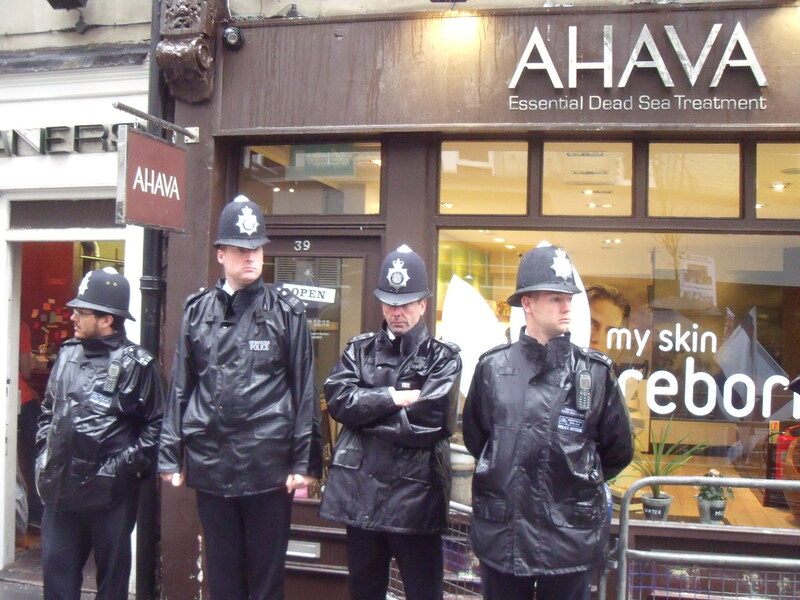 Police protecting Ahava from Palestine Solidarity Campaign activists.